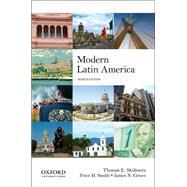 by Skidmore, Thomas E.; Smith, Peter H.; Green, James N.
Now thoroughly updated in its eighth edition, Modern Latin America is a lively interpretive history and the leading text in the field. Featuring vivid, anecdotal illustrative boxes, the book uses case studies to discuss the major countries and themes of the region over the past 200 years. For each country, Thomas E. Skidmore, Peter H. Smith, and James N. Green examine such central themes as European-New World interaction, racial mixtures, military takeovers, and U.S. intervention in the area. Visit the companion website at http://library.brown.edu/modernlatinamerica/. Thomas E. Skidmore is Carlos Manuel de Céspedes Professor of History Emeritus at Brown University. He is the author of Brazil, Second Edition (OUP, 2009), Politics in Brazil, 1930-1964 (OUP, 2007), and The Politics of Military Rule in Brazil (OUP, 1990). Peter H. Smith is Distinguished Professor of Political Science and Simón Bolívar Professor of Latin American Studies at the University of California, San Diego. He is the author of Talons of the Eagle, Fourth Edition, (OUP, 2012) and Democracy in Latin America, Second Edition (OUP, 2011). James N. Green is Professor of History and Brazilian Studies at Brown University. He is the author of We Cannot Remain Silent: Opposition to the Brazilian Military Dictatorship in the United States (2010) and Beyond Carnival (1999). Portuguese America: A Different World? Liberal Ascendancy and "Republican Dictatorships"